Firefox. Internet Explorer. Chrome. Safari. Opera. We’ve pretty much all heard of them by now. They’ve been fighting for market share for the past few years (Internet Explorer has been fighting for it for a lot longer than that), and it’s unlikely any of them will ever come out the absolute winner. They try to be all things to all people. And that’s great. 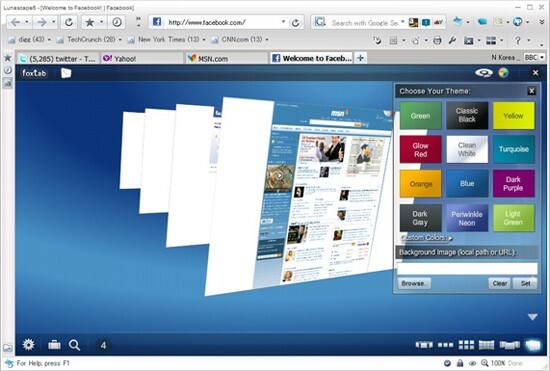 What if you’re looking for a browser that does just the things you want to do online? What if you’re sick of all the browser-war hubub and want something that’s truly unique and different (and, maybe, works better than the mainstream options)? What then? Well, there’s good news. There are more than a dozen excellent alternative browsers out there if you’re looking for something distinctive. Below are ten such web browsers, along with why you might want to consider using them. Stainless is a browser created in response to Google Chrome. It utilizes multi-processing architecture like Chrome (which, at the time of inception, wasn’t available for OS X), but also has some excellent features not found in other browsers. One of the most interesting features is the ability to log into one website using two different accounts in separate tabs. Why you should consider it: The ability to log into a site with different credentials in different tabs makes this an excellent option for many. It’s especially useful if you have, say, work-related Gmail accounts and personal Gmail accounts. Operating systems supported: OS X Leopard and Snow Leopard. 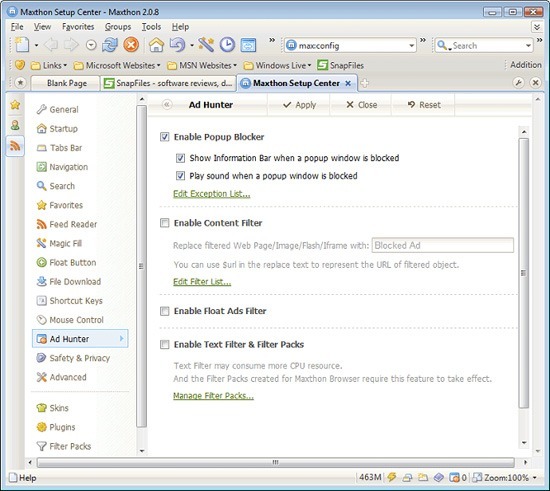 Maxthon is a highly configurable browser that places an emphasis on security. It has a built-in Ad Hunter that blocks most ads, as well as security features to prevent spyware, malware, and viruses. It lets you fully customize your browsing experience (you can choose between using menus, hot keys, word aliases, toolbars, or mouse gestures, plus there are more than 1,400 plug-ins to add functionality). It has filters available to block irritating or offensive content. Other Maxthon features include a built-in screen capture tool, URL aliases for faster surfing, a built-in feed reader, an online favorites service, advanced proxy rules, and an anti-freeze feature. Why you should consider it: If you want a customizable browser, Maxthon might be what you’re looking for; it’s built specifically for power users. Between plugins, skins, filter packs, and other customizable features, it truly lets you personalize your browsing experience. For parents concerned about their children’s’ activities online, the filters for blocking content can be reassuring. Sleipnir is very popular in Japan with a majority share in the country. It’s a profoundly customizable browser that maintains speed and performance despite customizations. There are skins and plugins available for it, letting you change the design and settings of the browser to suit your needs. And as all good browsers should, it stresses on security and usability, and allows for tabbed browsing. Why you should consider it: Sleipnir is an option if you want a highly customizable browsing experience. Swiftfox is an optimized build of Firefox that’s faster and more cutting edge than the regular Firefox distribution. It works with Firefox plugins, making it remarkably extensible. The overall user interface is similar to Firefox, but is a bit more minimalist and clutter-free. Most other features are in line with what Firefox has to offer. Why you should consider it: If you love Firefox but want something faster and lighter, then Swiftfox is your best bet. Lunascape is the world’s first and only triple engine browser. That’s right: it’s a hybrid browser that runs on Gecko, Trident, and WebKit. 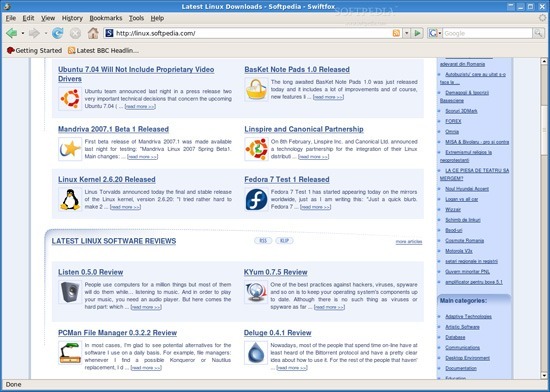 It supports plugins and add-ons from Firefox, Internet Explorer, as well as their own plugin platform. It’s touted to be faster and lighter than many other browser options. Why you should consider it: If you find yourself constantly switching back and forth between browsers (either for cross-browser testing of web designs or because of add-ons available only to Firefox or Internet Explorer), Lunascape is a perfect fit for you. 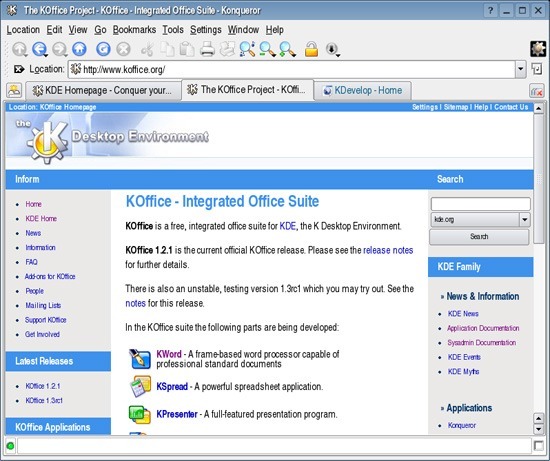 Konqueror combines web browsing, local and remote file management, and a universal viewing app that lets you view documents without having to launch other programs. It’s open source and HTML 4.01 compliant. It embraces Netscape plugins (like those for Flash or RealVideo). Konqueror also has a built-in FTP and WebDAV support. Why you should consider it: If you’re a Linux user who wants a browser that can multitask, then Konqueror is definitely something to look into. It’s especially useful for those who want to be able to manage files right from within their browser. 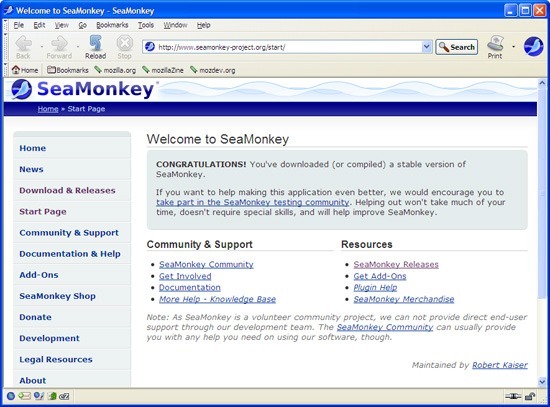 Why you should consider it: For developers and designers, SeaMonkey has a plethora of useful built-in features. It’s also a great option for people who like to run the bare minimum number of apps. Operating systems supported: Windows 2000 and newer, Mac OS X 10.4 and newer, and Linux. OmniWeb is a WebKit browser created by the same people who created OmniGraffle and OmniOutliner. It aims to be fun and easy to use (like other Omni products) and shares a similar user interface. It has all the standard browser features we’ve come to expect (including tabbed browsing, bookmarks, and ad blocking), but also includes Workspaces, which lets you save browsing sessions to open later and includes an auto-save option and a built-in RSS reader. 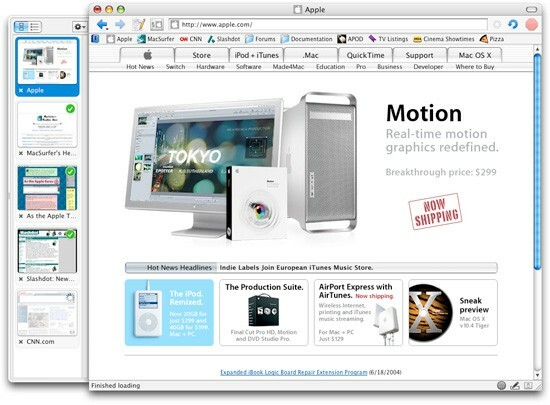 Why you should consider it: For Mac users who want a browser that’s efficient and easy to use, OmniWeb might be just what you’re looking for. It’s appropriate for power users too, and the Workspaces feature is especially handy. 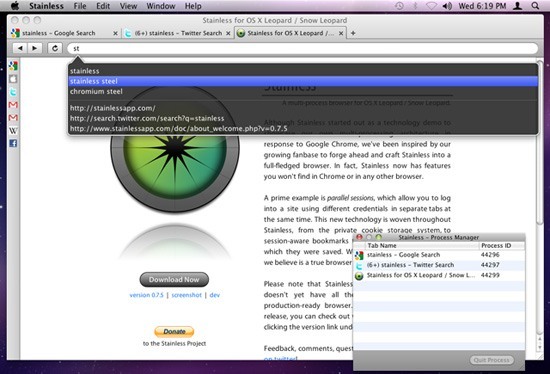 Think of Camino as a Firefox build specifically for Macs, built on the Gecko 1.9 rendering engine. It includes phishing and malware protection, tabs (including a tab overview function that lets you see all your open tabs at once), “annoyance blocking” (which blocks ads, pop-ups, and Flash animations), Keychain support (to save your browsing credentials), and download notifications. It also includes AppleScript support, feed detection, session saving, recently closed tabs, and full keyboard access. 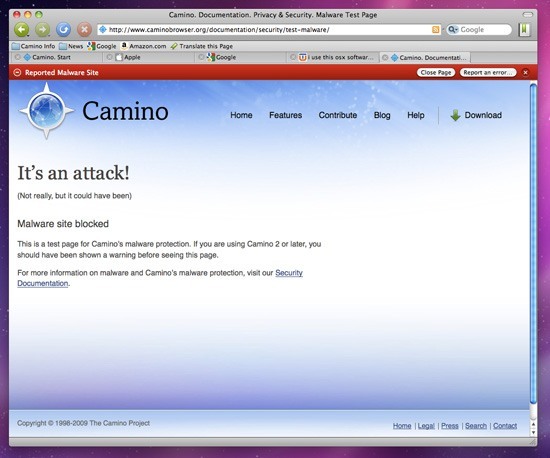 Why you should consider it: Camino is a great browser for Mac users who like Firefox but want something built specifically for the Mac. 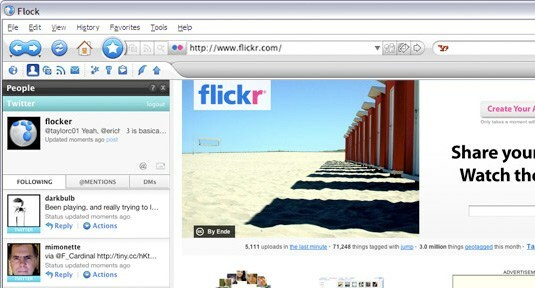 Flock is probably better known than many of the other browsers above, especially if you’re a social media addict. Flock was created specifically to make managing your social media activities easier from within your browser. Flock focuses on staying connected through social media by making sharing and publishing things easier. It integrates directly with Facebook, Gmail, Digg, YouTube, MySpace, Flickr, Twitter, WordPress, Blogger, Delicious, Bebo, TypePad, Picasa, and more. Special features include a People sidebar, a Media bar (to browse photos and videos from your favorite sites), a built-in feed reader, a photo uploader, a blog editor, and more. There are also extensions and custom themes available for download. Why you should consider it: Flock is a great choice for social media power users who want to be able to connect with all their social media accounts from one place. For companies, I wouldn’t recommend optimizing your site with SEO techniques for any of these browsers because they just don’t have traffic other browsers have, such as Google Chrome or Internet Explorer. But if there is a reason you feel it would be good to do, I’d recommend trying some A/B or multivariate testing for the pages you would like to try to optimize for one of these browsers. These are better to use for individuals because they can choose a browser that tailors to their internet habits.